The battle between Mazinger Z and Mechanical Beast Baron Ashura is in full swing! Meanwhile, we get a deeper insight into the mystery of Kouji Kabuto's demise after The Great Mazin War. Enjoy! As always, thanks to OtherSideOfSky and HappyScans! for their continued work on this series. I wanted to get this chapter out last week, but I had to leave town for a few days and was unable to release during that time so this is a belated release. 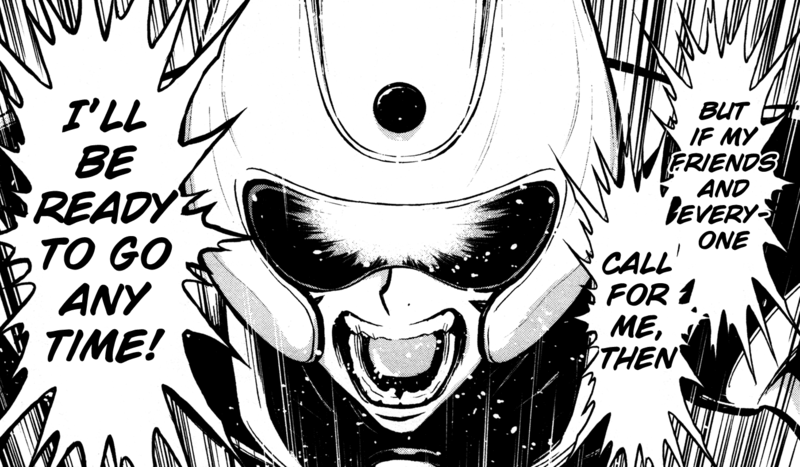 However, the next chapter of Shin Mazinger Zero will be out later this week. See you then! It's time for another release and this time it's a new Kyomu Senki chapter from Takeru Kyori and released in part with HappyScans! This chapter is from a short story called New Rashoumon originally published in 1994. It also features a couple of new pages for the Kyomu Senki compilation and a couple other pages borrowed from another series in this collection (which I will avoid naming for now due to potential spoilers). "Onmyou & Onmyouji - the term "onmyou" that was used in both this chapter and the last is the Japanese word for the Buddhist "yin yang" concept, and onmyouji were practitioners of the art. Although generally thought of like sorcerers, they were a real profession in feudal Japanese society. Generally their duties involved divining and fortune telling, but they were indeed responsible for protecting the capital from vengeful spirits, or "onryou" as they're known in Japanese. In addition, the Crown Prince Sawara who's mentioned in this chapter was historically one of these "onryou" haunting the capital city of Heian-kyo (which becomes modern-day Kyoto). Mikado - an archaic term for the Japanese emperor. Mandalas & Shumisen - "Shumisen" is the Japanese word for Sumeru, a sacred mountain in Buddhist mythology that is home to various celestial beings. Mandalas are Buddhist symbols that represent the universe, generally consisting of a circle contained by 4 points arranged in a square. They often take the form of painting scrolls, depicting various aspects and deities of Buddhism, and are used in various rituals. 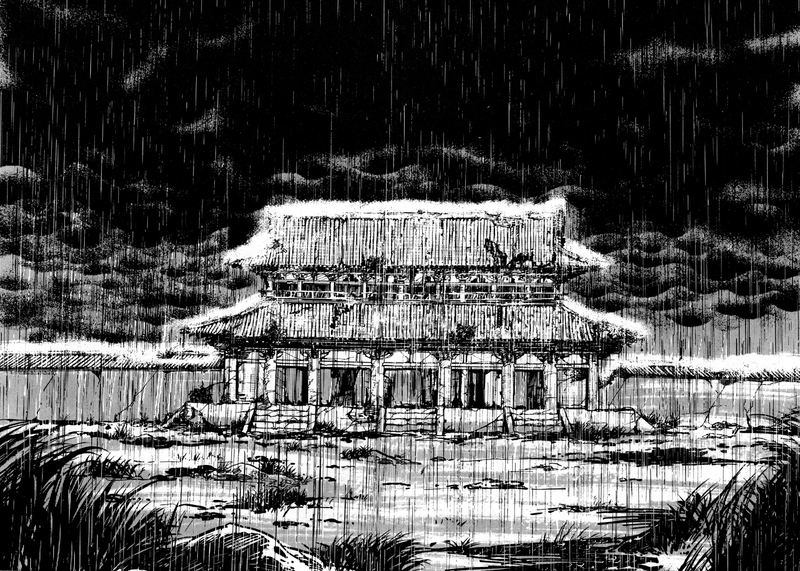 So, if you hadn't noticed yet, this series has a lot of Buddhist influences, throughout. I'm going to do my best to point these things out as we go, but I'm certainly not claiming to be any sort of expert. Buddhism is a complex subject, and even within Japanese Buddhism alone, there are numerous different sects, all with their own traditions and focuses. I'm doing my best to learn about it as I go, and I'll share some of the basic info I pick up, but I'd encourage anyone interested to research these things further. There's plenty of material about it to read online. And if anyone who actually knows what they're talking about ever catches me saying something blatantly wrong, please let me know about it! Like I said, I'm learning as I go, so a more educated perspective would be great to hear!" Now relating to Shin Mazinger Zero, I'd like to apologize because I had previously said that Vol 4 Ch 2 would be released this week. Well that was a mistake on my part because I hadn't realize that it hadn't been translated yet! Sorry about that, I'll try to get the workflow back up to speed in order to avoid any downtime between releases and I'd say to expect Shin Mazinger Zero vol 4 Ch 2 next week. 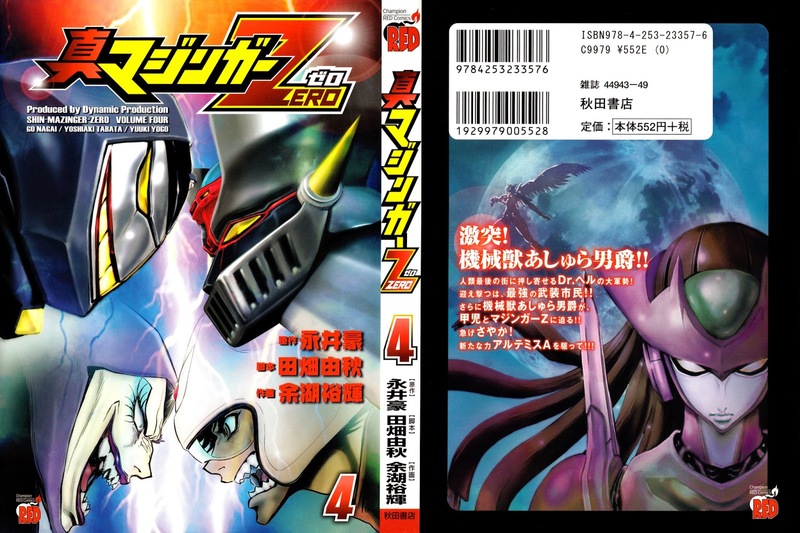 And so begins volume 4 of Shin Mazinger Zero! In this chapter, Minerva's world keeps tumbling down, tumbling down and tumbling down. Will it all return to nothing? I thought this would be an easy chapter to work through, but I was a fool for thinking there would be an easy chapter of this series. So sorry about the late release this week. I'll be back next week with more, so see you then! Thanks to OtherSideofSky for translating and thanks to our friends over at HappyScans!